The National Park Eifel is very accessible by public transport. Regional trains from Cologne run hourly to Kall, and from Kall train station you can take a bus to the stop "Gemünd Mitte, Schleiden". From here it is about a 10-minute walk to the National Park Gate Gemünd. The park can be reached via four major motorways: A4 to the north, A44 to the northwest, and E42/A27 to the west. To get to the main visitor's center from the Cologne area, follow motorway A1 south to exit 111 Wißkirchen. From here take B266 southwest into Gemünd and follow signs to the park. Bus lines 63, 231, SB82, and 829 all make stops at Gemünd Mitte, Schleiden. If traveling via Kall train station, take bus 829 to Gemünd Mitte, Schleiden. It is a 10-minute walk from here. Bus lines connect the towns surrounding the park, and certain buses bring you straight to hiking trailheads. As North Rhine-Westfalia's first national park, this nature-lover's paradise boasts over 110 km² of stunning landscapes and roughly 1600 endangered plant and animal species to explore. From forests to lakes, grasslands to shrubs, you will get a taste of several different types of landscapes within this impressive park. What is even more impressive is the park's commitment to sustainability and accessibility. The park, as well as its nearby hotel and tourism partners, offers "barrier-free" travel, allowing all types of people- including those with any kind of disability- to get the most out of their experience at Nationalpark Eifel. Start your visit at an information center at one of the National Park gates, where very knowledgable staff are eager to help you. Here you can find a wealth of information on all of the tours and programs offered by the rangers and guides. Park rangers offer for visitors to join them on hikes without any reservations on most days of the week- for free! For the fit and ambitious, take a long hike along the Wilderness Trail. This starts at Monschau-Höfen in the south and leads you all the way north across every type of terrain the park has to offer over the course of four days. If you're feeling adventurous, you can do the hike independently, otherwise you can enjoy a bit of luxury by booking a package deal with which many aspects of the hike are organized for you. There are countless other hiking trails of different lengths and difficulty levels to take advantage of as well- go out and explore the wildnerness! Take a trip through history at Vogelsang, located within Nationalpark Eifel. The complex was built by National Socialists in 1934 as a site of ideological training and afterwards was used as a British and Belgian military training site until 2005. It has been open to visitors since 2006 and is currently searching for a contemporary identity as it undergoes construction (as of 2013) to become a place of remembrance and reflection as well as activity and leisure. Take a day trip to the LVR Freilichtmuseum in Kommern about 20 minutes from Gemünd to the west of the park. Here you can experience what life in the former Prussian Rhine Province has been like since the late 15th-century. In this entirely reconstructed, traditional-looking village, you can immerse yourself in the daily lives and activities of bakers, smiths, farmers, and more. This interactive museum is a great activity for the whole family. Enjoy the national park from a different perspective and take a boat tour on the Rursee, or Rur Lake, available from April to October every year. Tip: go on the first or third Monday of the month and enjoy the company and insight of a park ranger! Set over 2 levels in a historic 300 year old building, this holiday home is situated just a 7-minute drive from the Eifel National Park. It includes a terrace with a seating area and barbecue facilities. 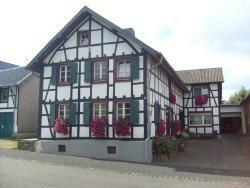 Set on the edge of the Eifel National Park, this modern apartment is set on two floors in a half-timbered house. 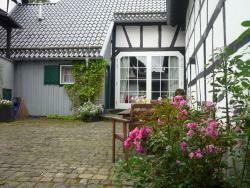 A fully equipped kitchen and free WiFi are featured at Ferienwohnung Dürbaum. This hotel in the Eifel National Park overlooks Lake Rursee. It offers wonderful lake views, free use of the sauna area and free Wi-Fi. Heimbach is a 5-minute drive away.